Chris came to me at the beginning of January, having had a squamous cell carcinoma removed and a total axillary clearance with four weeks of radiation last October. The swelling in her breast started almost straight away after the surgery and she had been for a number of treatments with a physiotherapist who diagnosed her with lympoedema. She also has a small amount of cording which doesn’t seem to impact her too much. At the time of her first visit her L-dex was at 19 (it had got as high as 32, so that was a major improvement). She is a fit, active 71 year old who delivers pamphlets and who goes to the beach every day. She has made a lifestyle choice to be a sun-worshipper and doesn’t use sunscreen because she feels it’s filled with chemicals. Otherwise, she’s really healthy, takes heaps of vitamins and generally lives a very social life. But the lymphoedema was really bothering her. After her first treatment I sent her to get a compression sleeve and unfortunately she was given one that was not strong enough. I also made her a “swell spot” from Mobiderm bandaging to use in her bra to break down some of the fibrosis in her breast. At the second treatment she said she was really pleased with the “swell spot”, she felt the swelling was down and she was more comfortable. We added some laser to the treatment and added a homeopathic remedy called Lymphomyosot which she bought from the homeopath next door. I didn’t see her for about ten days as she was seeing the physiotherapist in that time. Her elbow had swollen up before she saw the physio, so luckily she was given some bandaging at that visit which helped, but there was still significant swelling. She came into the treatment with bandaging just around her elbow which she had done herself, having cut the bandages to size. I explained that bandaging had to start from the fingers and continue all the way up. We discussed getting her a ready-made Mobiderm sleeve to wear at home at night to see if that helped. In the meanwhile I cut a small piece of Mobiderm bandaging to place at her elbow until the sleeve arrived. At the next visit the following week she tried on her new sleeve and loved it so much she decided then and there to wear it all the time. It was much more comfortable than her usual compression. I suggested she bandage her hand at night just to make sure fluid didn’t make its way down (there had been some the previous week) and gave her a DVD to watch to help her learn how to do it herself. The following week she had a follow up with her physio who said L-dex had gone down from 22 to 15, great work! But the best news is, less pain, less swelling and discomfort. All in one week. What more could you ask for? She also had a consultation with Dr Helen Mackie at Mt Wilga who suggested she think about having one week’s intensive bandaging. She’s seriously considering that when she gets back holiday. Here she is sporting her Mobiderm garment – out and proud! Some of my clients who have lymphoedema post breast cancer have said they’ve been following my video showing how to do their own clearing and I’ve had to remind them that for those who have had lymph node removal or radiation the process is slightly different. So I thought it would be best for me to make another video showing how to create pathways and clear the arm properly. Recently I was contacted by a local chiropractor after I treated one of his patients for swelling in her foot. She’d had treatment from him, from a podiatrist and had been to see a foot specialist but after two sessions of Manual Lymphatic Drainage her condition had improved significantly. He wanted to know more and to see if there were ways we could refer to each other to enhance our individual treatments. We did a “body swap” – he gave me a chiropractic treatment and I have him a lymphatic treatment. And he offered to write a guest blog for me on a subject we both deal with – sinus. Here’s what he has to say about using chiropractic for sinus treatment. And here’s a link to a post I wrote a while back about Manual Lymphatic Drainage for sinus (among other things). Do you wake up with a stuffy head and mucus in your throat? Do you have a headache behind the eyes? Do you suffer from cold like symptoms frequently? Then you may be suffering from sinusitis. Your sinuses are eight hollow cavities in the bones of the forehead, cheeks and temples. Although they help you to breathe, they also prevent breathing sometimes, when they get inflamed and blocked with mucus. Healthy, open sinuses are lined with mucus to help ensure that the air you take into your lungs is moist, warm and free from dust, dirt and other pollutants. Without this filter, the lungs, kidneys and blood can become permeated with toxins. When the sinus lining is inflamed, swollen and full of mucus, the condition is called sinusitis. Sinusitis can commonly occur when you’ve had a cold and it clears up when the cold ends. However, if the drainage is blocked, pressure increases and can cause pain, discomfort, sinus headaches and swelling around your eyes, cheeks and ears. There are also some subtle signs of sinus difficulties, such as snoring, sore throat, coughing, sleep disturbances and a running nose. 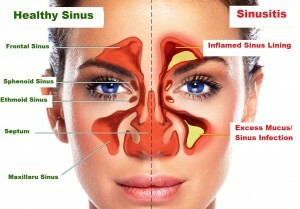 How can Chiropractic care help with sinus issues? Chiropractors understand the importance of a properly functioning nervous system and the mechanics of the body. So, decreasing the stress on the nervous system and removal of obstructions for the proper drainage of the sinuses, specifically in the neck and back, will help your body work more efficiently and allow the bodies fluids to drain without interference. When you have restriction in your joints in your neck or cranial bones, you will find the muscles that attach to them to become stiff and the joints also become swollen and when these areas are restored from chiropractic adjustments, you can find it will dramatically assist with the recovery from the condition. There are also specific chiropractic techniques designed to free up the sinus area from blockage. This generally involves a gentle massage of the nose, forehead and cheeks to release the pressure on the sinus cavities and allow the area to drain properly. The other way that chiropractic can markedly help these problems is through increasing a person’s general health, and the strength of their nervous system. Evidently, when your body is in a better condition, it will have a stronger immune system and be able to fight infections and sicknesses more easily. Consequently, if you get issues with your sinuses, whether it be sinusitis, regular colds, congestion or stuffiness, consult your Chiropractor or give the professionals at ABSOLUTE HEALTH SOLUTIONS a call today and see how they can help on 9948 2826.